Most kitchen work involves the use of sinks; from prepping to the last washed pot. Sinks add to the aesthetic appeal of your kitchen and, of course, are functional. So, for your kitchen remodeling plans make sure to find a sink that fulfills both practical and aesthetic needs. What Kind of Sink Should I Install? Kitchen sinks can be made from several different materials, including; stainless steel, cast iron, solid surface, composite, and acrylic. The material is usually an aesthetic choice but can also affect the function. High-quality stainless-steel sinks are very sturdy. They are easy to clean and, compared to other sink options, are affordable. On the other hand, they are also one of the noisier ones—especially if you drop your silverware or plastic Tupperware—they easily display dried water spots, and scratches show up almost instantly on their surface. Sound deadening material placed under stainless steel sinks help reduce noise and improve strength. Stainless steel sinks come in varying metal thicknesses and gauges. Keep in mind that a smaller gauge means thicker metal. Meanwhile, cast iron sinks are easy to clean and maintain. Just like stainless steel, they’re also durable. Cast iron also happens to be incompatible with abrasive cleaners as they can scratch and dull the finish. Enameled cast iron sinks are prone to chipping and scratching. Solid surface sinks provide seamless joints with counter-tops of the same material. They are also durable, better handle dropped objects, and are easily reparable. Using composite or artificial stone sinks will give you reasonably scratch-resistant and heat-tolerant option. However, scuffs and scrapes harder to remove. Acrylic is an economical option. However, it is not heat-tolerant, and can be vulnerable to staining from petroleum-based products. Want to Have The Best Scheme Design for Your Kitchen? Here are 3 of 2018’s Top Kitchen Trends! According to the National Kitchen & Bath Association (NKBA), small kitchens should consider single-bowl sinks. Larger kitchens can afford to have double- or even triple- bowls. 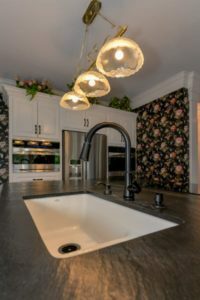 While large sinks like farm house sinks can be appealing in and of themselves, and functional when washing pans or filling large pots, they also decrease counter space—which is also usually a premium in the kitchen. A large sink that looks great in a close-up picture may look out of place in the full context of the kitchen. What are the Best Configurations? Depth. If you plan to go heavy on the dishwashing, you may want to use deeper bowls with straight side walls to accommodate washing and soaking large pans and pots. The flat bottom should also add sufficient space for stacking dishes while washing. Sink Divider. When choosing a double-bowl sink, choose the one with a lower-leveled divider. This will prevent overflow while you’re doing dishes as it will allow the water to flow to the other bowl. Offset Drains. Choosing a sink with offset drains will allow for smooth, even draining regardless of what’s soaking in the sink. With the drain to one side, there’s also more space for stacking washables. What is the Best Mounting Style? There are three basic mounting styles for kitchen sinks: drop-in, flush, and undermount. The drop-in style is done by mounting the sink on the countertop. 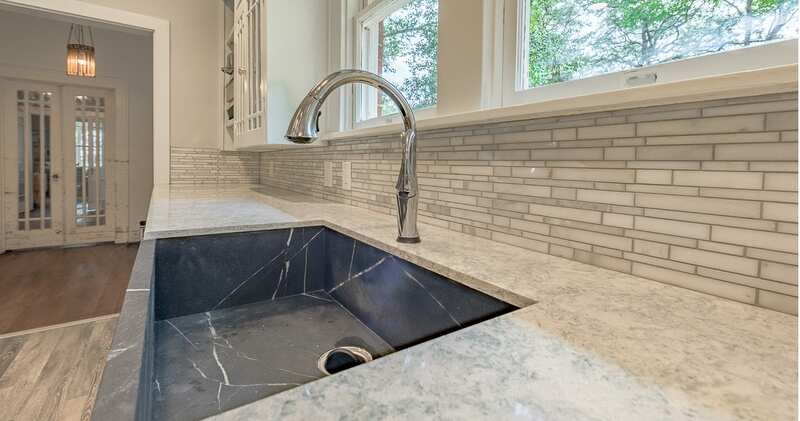 It’s the easiest way to install new sinks into existing countertops. You are, however, left with a rim above the countertop that is more difficult to clean. In a flush style, the mounting is similar with that of a drop-in. However, it is even with the countertop. More commonly done in the past when laminate counter tops were prevalent, this mounting style employs a metal mounting strip that tends to collect grime. The undermount sink has become the most popular sink in modern kitchens due to the ease of cleaning. Debris and water can be wiped right into the sink with no obstruction. However, this mounting style does not work well for laminate or tile countertops.